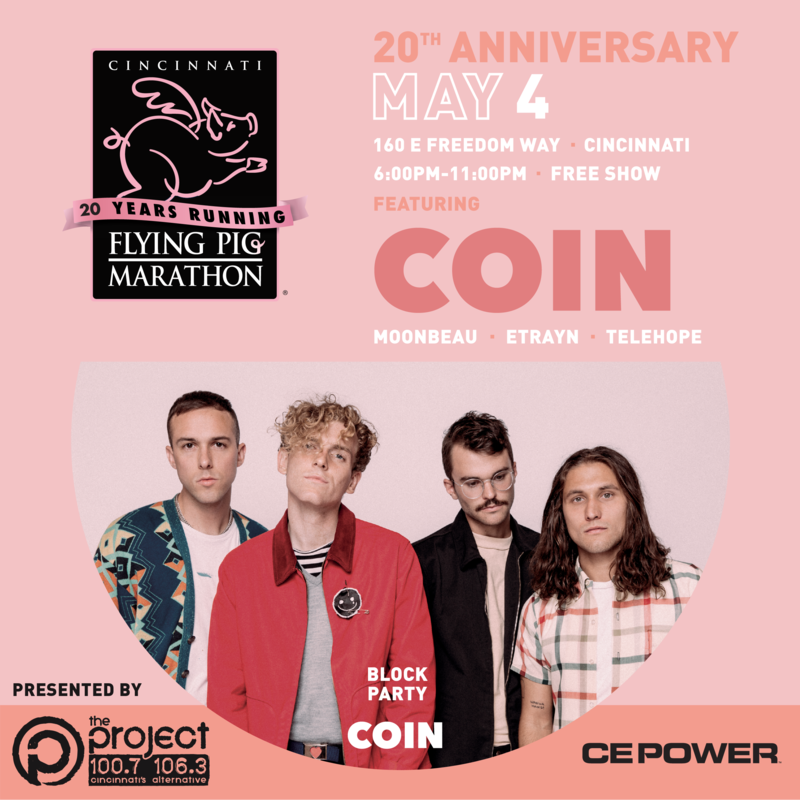 COIN, the indie pop band from Nashville, will headline a free concert on Friday, May 4, beginning at 6 p.m. at The Banks on Freedom Way. 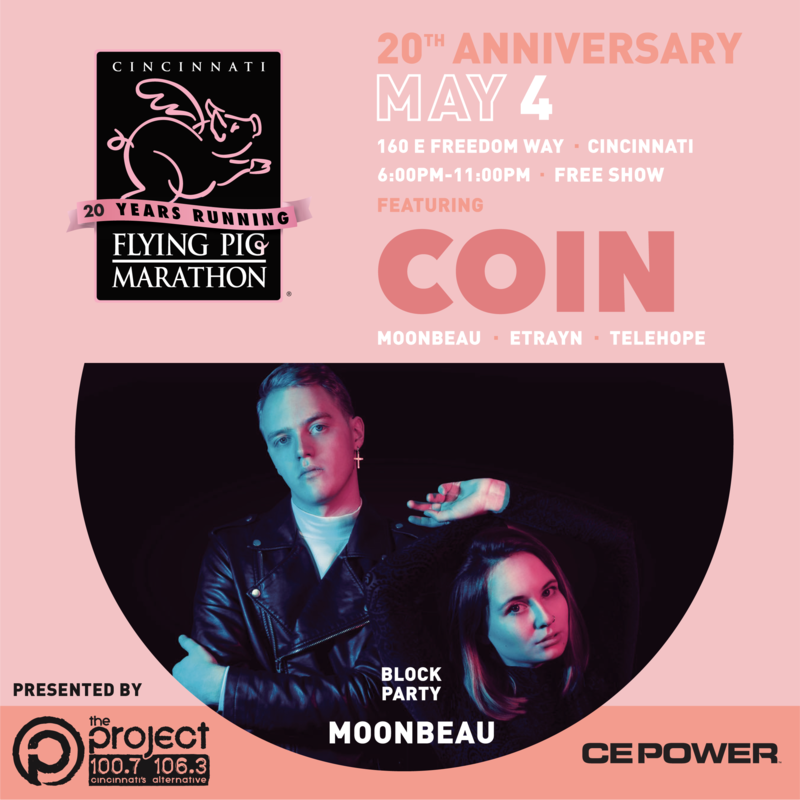 The concert, presented by The Project 100.7/106.3, and in partnership with CE Power, will also include performances by DJ E Trayn, Moonbeau and Telehope, is free and open to the public. COIN, formed in 2012 released “Saturdays” in 2012 and “1992” in 2013. They gained mainstream attention in 2015 with their hit, “Run” from their eponymous album produced by Jay Joyce. They gained further mainstream success in 2016 with the lead single, “Talk Too Much,” from the band’s second studio album, “How Will You Know If You Never Try,” which was released on April 21, 2017. Members of the band include: Chase Lawrence (lead vocals, synthesizers), Ryan Winnen (drums), Joe Memmel (lead guitar, backing vocals) and Zachary Dyke (bass guitar). 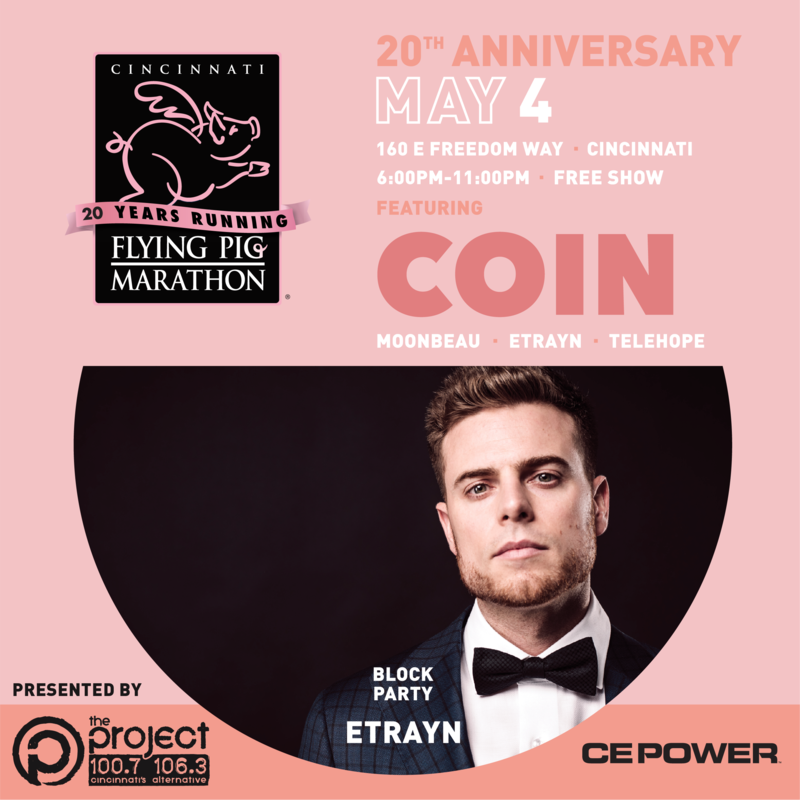 DJ ETrayn is well known around Cincinnati and establishing a bigger following outside of the city by hosting the largest concert series in town, playing with national acts on a weekly basis, and DJ’ing regularly at venues such as PLAY, LUNAR, and PAVILION, among others. With a passion to make the crowd move, he plays sets with all types of genres and styles. He has had the privilege to open/DJ with artists such as Usher, Young Money, Jermaine Dupri, DJ VICE, MGK, Lil Flip, GZA from Wu-Tang, Project Pat, Young Jeezy and Mike Posner, just to name a few. He currently holds residencies at Lunar, Pavilion, and Woody’s. Moonbeau started as a synth-pop solo-project by Christian Gough of The Yugos, an indie rock staple in Cincinnati. Through Moonbeau, Gough was able to focus on improving his home studio production techniques and use throwback pop sounds compared to what you’d hear on an A-HA or Flock of Seagulls record. Over the last two years, Gough’s project Moonbeau has picked up speed with help from new band members Claire Muenchen (keys/vox) and Alex Murphy-White (drums). Last year, the group signed to Old Flame Records and began recording their first debut album. If you are looking for infectious melody and a danceable beat, Moonbeau will never disappoint. Powerful choruses and simple, yet catchy, guitar leads will ensue. Delivering a sense of nostalgia with almost every note, Moonbeau will make your heart flutter and break. Telehope is an up and coming fresh indie pop outfit from Cincinnati, Ohio. The energetic 4-piece formed in late 2016 and is comprised of Mark Brad (vocals/guitar), Ben Malson (keys), Adolph Goetz (guitar) and Nate Trammel (drums). Telehope released their debut, self-produced full-length album “Chasing Dreams” last January, partnered with three sold out hometown shows in 2017. Their music has been featured in national reality TV shows such as A&E’s Born This Way. The bands mission it to give hope to its listeners through encouraging lyrics and powerful messages in their songs, as shown in songs like Remedy through the struggle of loving someone when it’s difficult. 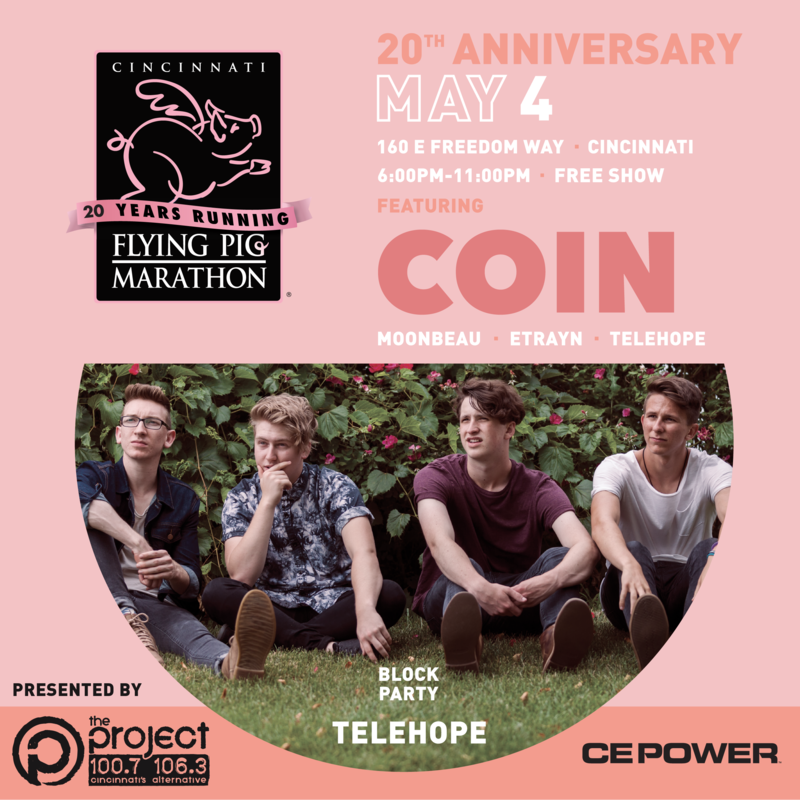 Through receiving popular TV show sync placements, hundreds of thousands of Spotify listens, and three sold-out hometown shows in 2017, Telehope has started to take over the Cincinnati Indie music scene.